Before entering employees, set up all Departments, Job Titles, and Unions in the System Tables. Technical->System Tables, select the appropriate table. When all entries have been made, press Save. Select the Hire-in Date and Probation Ends dates from the drop down calendars or type the date in the fields using format mm/dd/yyyy. Hours Per Work Day and Hours Per Pay Period are formatted in hours:minutes. Type in the appropriate number, or use the arrows. Use arrows to indicate hours and minutes. Pay Rate/Salary: Employees paid hourly should indicate their hourly rate. Salaried employees should indicate their yearly rate. Select the appropriate Pay Type from the drop down, Hourly or Salary. 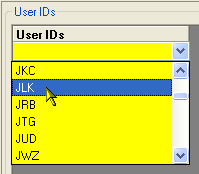 Indicate their User ID to save the new employee. New employee info must be saved before adding/importing hours.